I’ve said for many years that GoPro Inc. (NASDAQ: GPRO) was never going to be a mass-market product. It’s not exactly a fad, and GoPro stock isn’t a fad stock, either. was a neat little product that found a niche user base. However, there’ve been to other problems which have always dogged GPRO as a company and GPRO stock. The first problem is that the technology, while cool, never really lent itself to being a quality platform. The HD imagery is great, but I have yet to find a GoPro that delivers really good or useful sound. The second problem was the inevitable competition and that it would most likely come out of China. Will sure enough, Xiaomi’s Yi Action Cam turned out to be exactly that. Even though it was not released to stateside, it did end up providing significant obstacles for GoPro to expand internationally. The Xiaomi product is also superior, with higher video and still resolution, enhanced burst photo rate, enhanced video recording capabilities, and enhanced connectivity. However, as often happens, a competitor may turn out to be a white knight. As GoPro stock revenues and earnings have cratered, rumors are flowing that Xiaomi may acquire GoPro. The very fact that CEO Nick Woodman has said that he’d be open to a buyout also tells me that an acquisition is very likely. It may also indicate that Woodman just is not very good at public relations. By saying that he is receptive to an offer, it is tantamount to admitting that the company has no real future on its own. I think one of the major reasons that Xiaomi is looking at GoPro is because it does have a genuine presence here in the United States, with about 50% of its revenue generated here. Since Xiaomi does not have a presence in the United States, buying cheap GoPro stock is easier than reinventing the wheel. 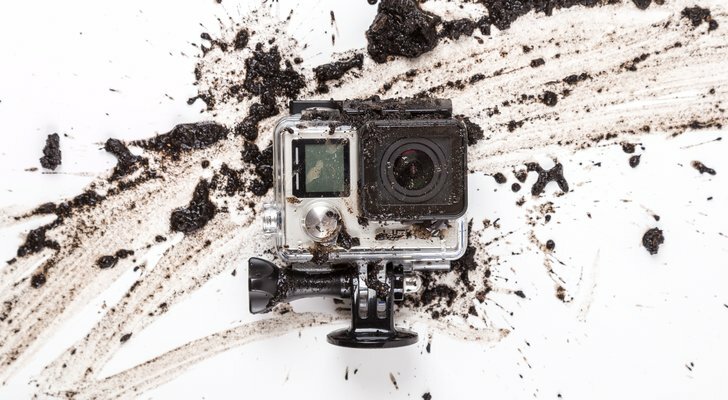 GoPro stock and its financials are in real trouble. 2015 revenues were $1.62 billion. They crashed $1.19 billion the next year, and stay that way in 2017. Gross profit fell from $673 million in $2017-$462 million in 2016. However, cost of revenue increase in 2017, driving gross profit down to $384 million. A $55 million operating income achievement in 2015, became a loss of $373 million in 2016, and thanks to slashing expenses, was only a $163 million loss last year. After losing $419 million in 2016, GPRO stock lost $183 million last year. Meanwhile, GPRO stock saw $60 million and negative free cash flow last year, which was an improvement from a $150 million. With $246 million in cash in $130 million in debt, GoPro is experiencing a liquidity crunch. What might the company fetch from a possible acquisition? It’s not like Woodman can demand much of a premium. If we figure one time revenue, or $1.1 billion, that would be about a 30% premium over today’s closing price of $5.58 a share, or about $7.50 per share. There’s probably a dollar worth of downside if no deal close through, so aggressive speculators may find this of interest. Article printed from InvestorPlace Media, https://investorplace.com/2018/04/gopro-stock-acquisition-rumors/.